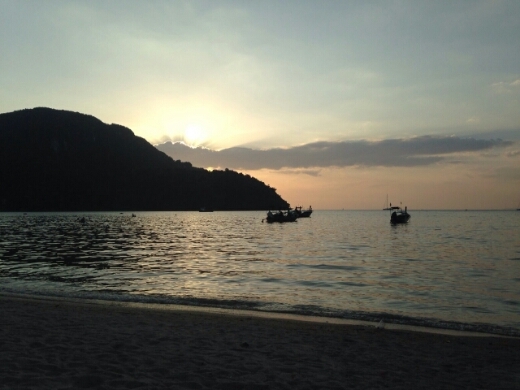 Bangkok to Koh Phi Phi – Where's Walton? Thailand was the first country I ever travelled. It was back in 2010 and it was a graduation treat for Bekki and Kerrie (basically spending the remains of our student loan). It was very different back then, we had the ease of simply following our friend Alex around for 3 weeks. 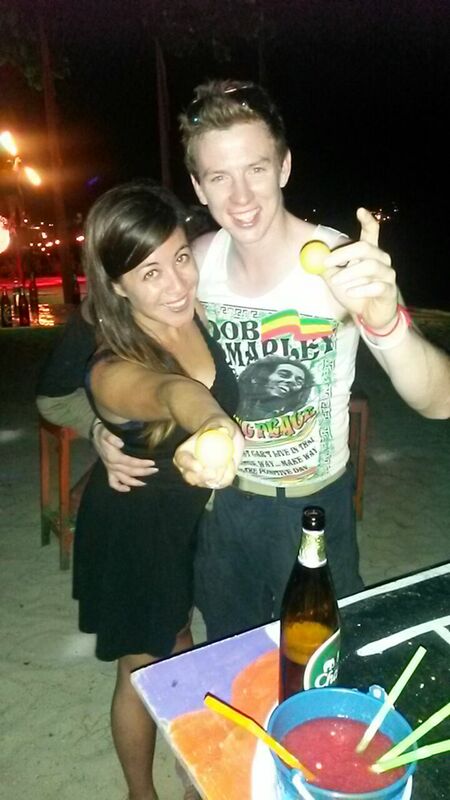 He had lived in Thailand a year so he knew how to haggle and where to go. So for the last few weeks of Bekki’s travels this time around, we thought the Thai Islands would be a great place to end her trip with me. Previously we did Koh Phangan and Koh Tao then headed up to the north of Thailand where we spent the majority of our time – this time it was all about the islands and we wanted to see a few more that we’d missed before! And mentioned in my midway travel blog Sophie from home was joining us too. 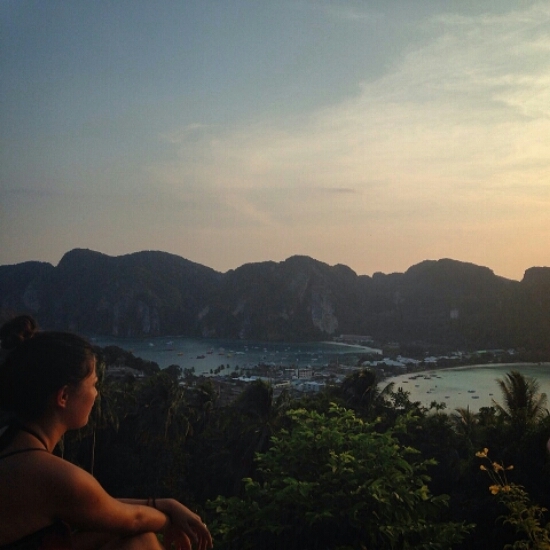 Sun, beaches, cheap food, pad thai… what more could we want? 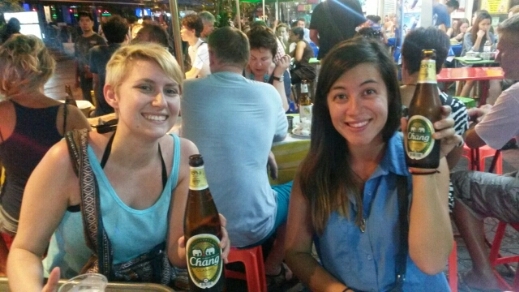 We met up with Sophie in Bangkok. We had a lovely night in a real hotel room (which we totally gatecrashed – hello bathrobes and a kingsize bed! ), and finally had Pad thai noodles and Changs which we had at Guns Restaurant, a street behind the famous Khoasan Road aka Backpacker Party Central. Strangely our nice hotel was above a McDonald’s which was awesome when we all fancied a hot chocolate that evening in our PJs. It was really nice to have a good catch up with Sophie after 6 months. She’s out here for a bit of an escape from normality too and I’m so happy to have her here but it also feels like no time has passed! Our first task that evening was looking at a map of Thailand. Where shall we go? We could go anywhere our hearts desired! 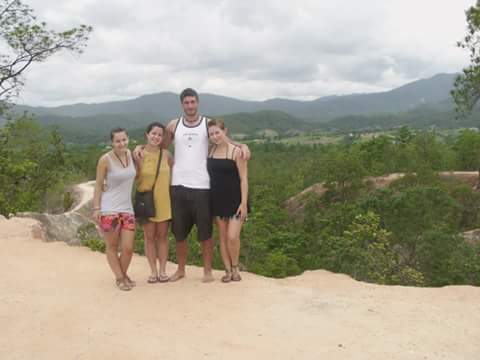 We genuinely had no plan or any idea where abouts the island were – there are hundred of islands to see in Thailand, and all we knew was that we fancied a more relaxed trip – we were not feeling the crazy full moon parties! 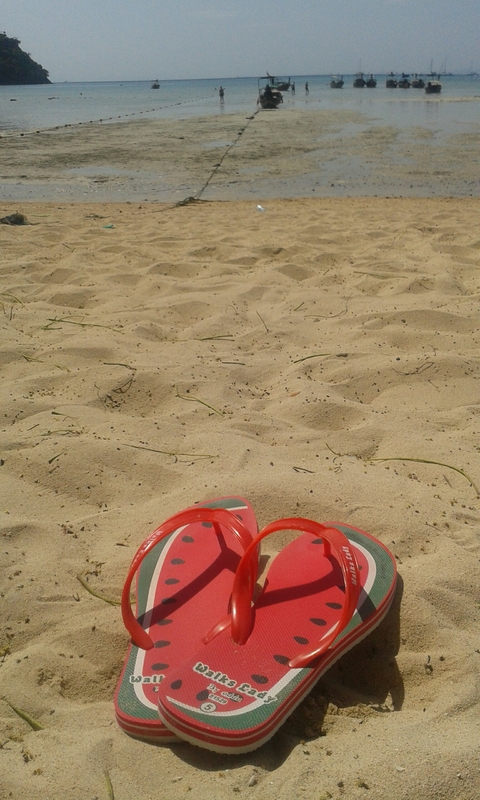 We looked at Koh Samet, Koh Chang and Koh Phi Phi… weather wise Phi Phi looked the best and was the furthest away. With two and a half weeks to use out logic was travel further, work our way back. Sorted. 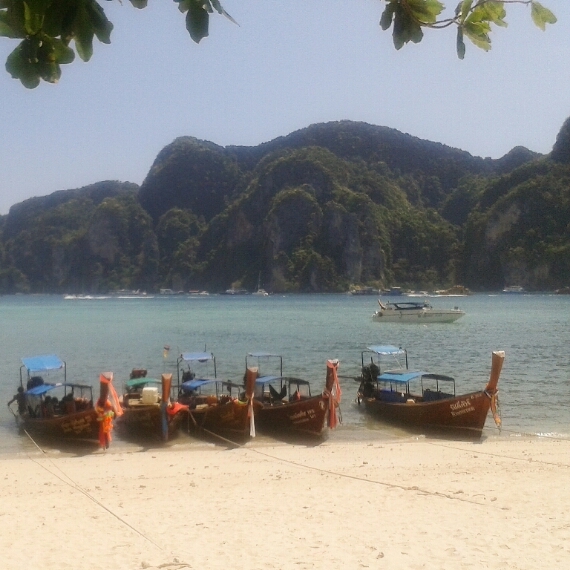 Bangkok to Phi Phi…800 baht (£16). Booked. Oh boy that was a long 12 hour bus journey, it was a sit up bus not a sleeper. I was sat with a random South Korean guy who got plenty of sleep on my shoulder. 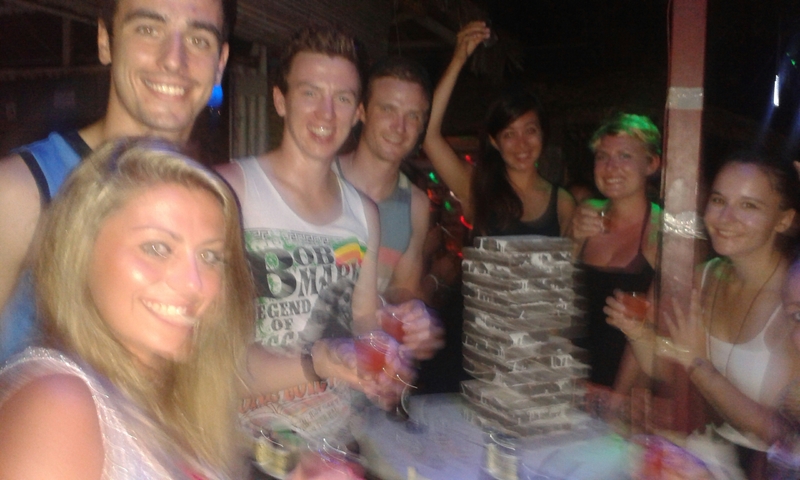 This was followed by 2 hour mini bus, followed by a truck taxi followed by a ferry we arrived on Phi Phi island. It took 18 hours in total with no stops to eat. None!! So straight away on Phi Phi we stopped in a café, ate brunch, dumped our bags and Sophie and I went on the hunt for cheap accommodation. I’m so glad we did this and that we didn’t prebook anywhere! Not only did we eventually find an awesome private room for £5 each in Harmony House, the dorm we almost booked (for double the price) online turned out to be a party hostel…and I like my sleep. It’s good to remember that many of the guesthouses and hostels here don’t earn enough to be online. So don’t be afraid to get here and shop around. It’s good fun. 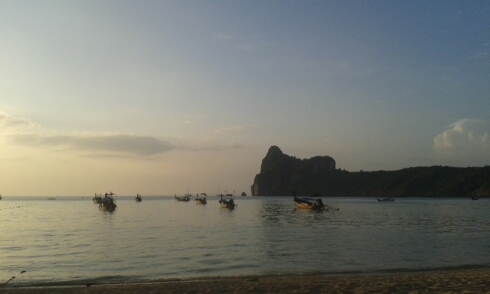 Koh Phi Phi is a beautiful Island. Touristy but not too busy. It’s known for having the beach from the film ‘The Beach’. It was badly affected by the Tsunami in 2004 and there’s still a lot of building work taking place! I find islands like this really interesting… by day they are paradise, beautiful sandy beaches and a very relaxed vibe. By night there’s fire shows, with ‘who can be the loudest’ club music from every bar on the beach, fire shows, the smell of burning oil and everyone drinking out of buckets. The few days on Phi Phi were pretty ordinary and not too eventful in comparison to the last few months of treks, new city every day etc but it’s been good to relax for a change…. beach time, lay ins, cheap food, sunsets on the beach, cocktails in the evening and great times with the girls. But the heat here really is a bit too much – so we tend to sleep a lot and we only went to the beach around 3/4pm when the midday heat was over. Another downside of Phi Phi has been the mosquitoes. They are back in fighting force and I’ve been eaten alive again. 51 new bites and counting 😦 and no amount of deet and repellent is deterring them!!! 1) I am the undefeated Beer Pong Champion. Who knew I had a talent for throwing a ping pong into a plastic cup? 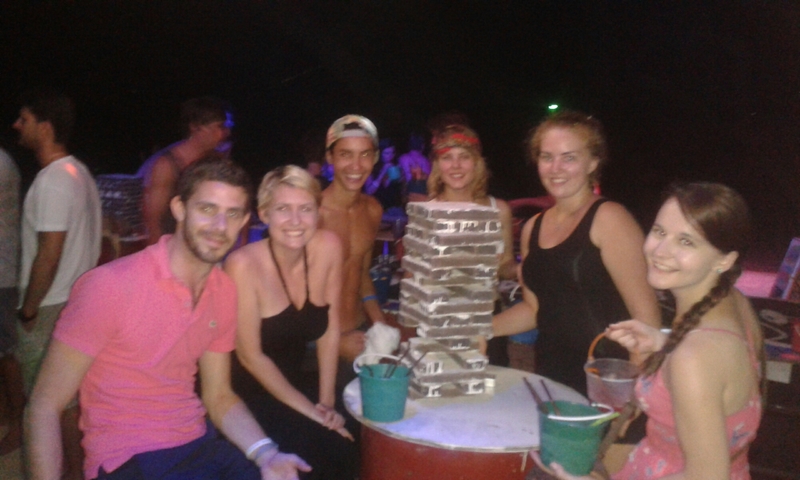 2) Met some awesome people during Jenga. One night there were us three brits, sat with three Welsh and three Irish…we went on a bar hunt for three Scots to complete our group but were unsuccessful. 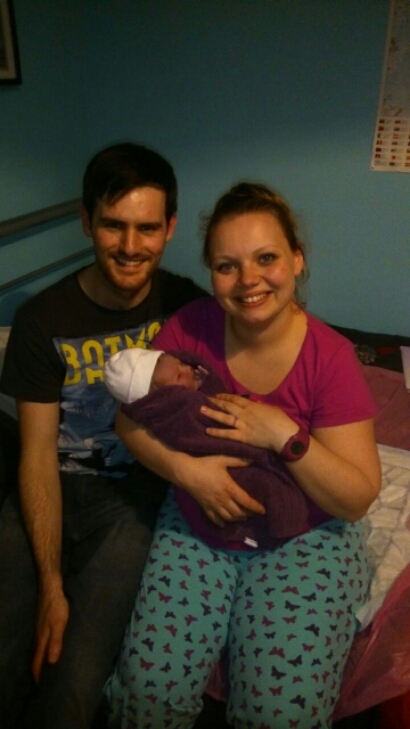 4) I found out the amazing news that my dear friend Amy gave birth to baby number two – Talulah Poppy Davidson! I’ll always remember Phi Phi for for eagerly awaiting the news. Congratulations Amy and Tom on creating another beautiful little girl!! I can’t wait to meet her. 5) This year’s April Fools Joke… that may need explaining. So we met Manny at the viewpoint at sunset the final day. A very lovely guy, you couldn’t meet a nicer person! He’s from Mexico and has just finished his Masters. He kindly joined us for dinner and we started talking about how it was April Fools Day. Anyways… we decided to tell all our friends and family on Facebook that we’d got married. At this point it’s 9pm and we figured everyone by now knows what day it is. So we were VERY surprised by the congratulations and support messages. 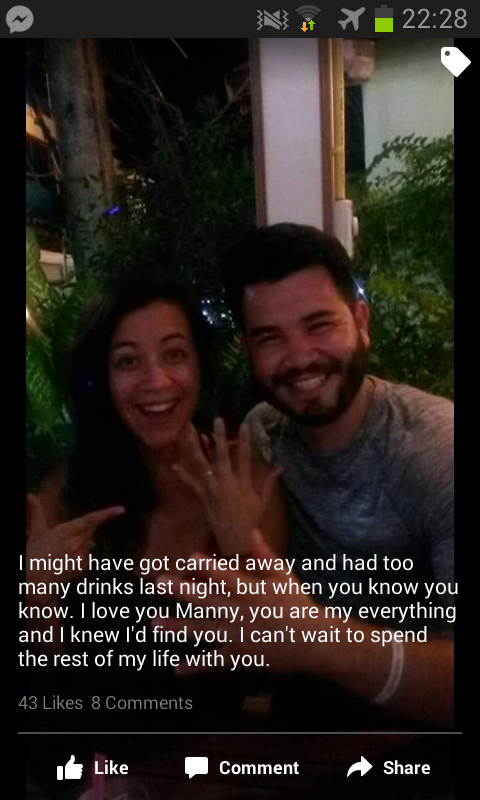 Sorry everyone, especially to Mannys mother. I am not married!! Since then I’m still getting messages from people asking me about my new man?? In case you wanted to read a little bit more, I thought I would share this week’s my stresses with you, in Bangkok and Phi Phi I have very much had money dramas. On arrival to Bangkok airport I found the cashpoint charge to withdraw money was £4. £4!!!! You have to be joking? After Googling this I found it was universal for all cashpoints in Thailand. And that’s on top of the 2.5% plus a withdrawal fee as well as a sterling fee. All in all is going to cost me about £10 to take out money which is madness. But when I tried to withdraw money Nationwide thought it would be a good time to block my card, (even though before my travels I listed out all my countries and all my dates! So as much as I appreciate the precaution, they know I am here.) *sigh*. So I was emailing them to try and sort the situation out – annoyingly they blocked my online banking too. But apparently I needed to ring them to accept an international call. Now at this point the amount of bank charges I’ve paid whilst travelling for 6 months could buy me two Air Asia flights… so I’m not best pleased that I have to pay £1.50 a minute to call them just to confirm my day of birth and address so they unblock my card but I was willing to do it as I was penniless on the other side of the world. Then after 4 days of emailing they tell me they’ve lost the original email and my phone number so I have to explain it all again. After doing this, then they tell me they cannot call me for another 4 days due to the Bank Holiday weekend. Useless!! It was 6 days without money at this point so I was close to tears. I am currently borrowing money off the girls so it’s lucky I’m not travelling alone anymore. Then I had a light bulb moment… Twitter. The power of social media. After Sophie posted a few tweets on what had happened – 20 minutes later Nationwide called me. Can you believe it? I’ve issued a complaint now. I’m not disappointed in this bank and the service they gave me. In addition to this I very much made a big error one night with my phone… After a night out at Blancs I woke up to find my phone was off airplane mode and I had made calls to a friend in Australia (it would appear that o2 have lifted my call block bar since I cancelled my contract a couple days before). Two days later a phone bill of £105 came in. Devastated to say the least!! It was a tough week to have money woes because I’ve been budgeting to squeeze in Japan next month… but I’m not going to let a bank or my own stupidity put me off seeing Japan.